Canning is a way of preserving food for a long time frame by packing them in airtight containers. The average rate of annual expenditure on packaged food has increased by 22.5% annually from the year 2010 to 2015. In accordance with ASSOCHAM India paper, due to rise in income level, a higher standard of living, greater confidence in packaged food, convenience and influence of the western world, the growth in annual expenditure is now expected to touch around 32% in the year 2017. Canned food is widely used in the hotel industry. Baked Beans, Button Mushroom, Baby Corn are few examples used in the kitchen. Some families also choose to stock their kitchen shelves with canned meats, sauces, and soups to shore up for quick trips and empty larder days. 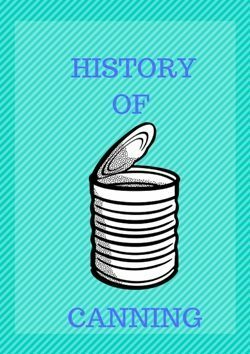 The method of canning food was invented by Nicholas Appert. He was a French chef, confectioner, and distiller who invented the method of preserving food by enclosing it in hermetically sealed containers. He invented this method for military’s food supply. During that year French forces fought battles in Italy, the Netherlands, Germany, and the Caribbean, highlighting the need for a stable source of food for far-flung soldiers and sailors. The Directory’s leaders decided to offer a 12,000-franc prize through the Society for the Encouragement of Industry for a breakthrough in the preservation of food. Pickling is one of the old forms of canning in which food is preserved by using oil and salt. The salt content kills all the bacteria while oil helps to keep the edible food fresh for a longer period of time. Some common canning liquids like oil, vinegar, juice, sugar syrup are used to stop the microbial growth of bacterial. Canned food are convenient. After a busy workday, instead of making fresh food, opening up some canned food packet and making the dinner as per instructions were given is quite user-friendly and time-saving. Canning preserves most of the food’s nutrients. Canned Foods are cost effective. Due to stability in price of canned food it has helped in controlling the expenditure. Seasonal Products are easily available in a canned form for round the year. Canned foods are helpful to reduce the food wastage. The biggest disadvantage of canning food is the potential for contamination. A canned product can never match the flavor of its fresh counterpart. find quality writing like yours nowadays. Clicking on the buttons the place i see the thumb. type of information in such a perfect means of writing? Cooking With Gautam. Copyright © 2017.